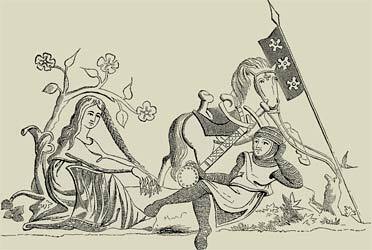 The romance of Medieval Courtly Love practised during the Medieval times of the Middle Ages was combined with the Code of Chivalry and the art of Chivalry. There were strict rules of courtly love and the art of Medieval Courtly Love was practised by the members of the courts across Europe during the Medieval times and era. The romance, rules and art of Medieval Courtly Love allowed knights and ladies to show their admiration regardless of their marital state. It was a common occurrence for a married lady to give a token to a knight of her choice to be worn during a Medieval tournament. There were rules which governed Medieval Courtly Love but sometimes the parties, who started their relationship with such elements of Medieval Courtly Love, would become deeply involved. 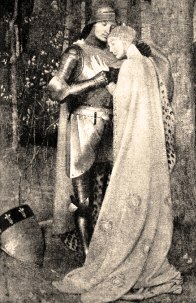 A famous example of a relationship which was stirred by romantic Medieval Courtly Love and romance is described in the Legend of King Arthur, and the Knights of the Round Table, where his Queen, Guinevere fell in love with Sir Lancelot. Many illicit court romances were fuelled by the practise and art of Medieval Courtly Love. The origins of Medieval Courtly Love were believed to be in Aquitaine in France in the 12th century and spread to other European countries. The art of Medieval Courtly Love was practised in English courts from the 1300's to the 1500's. During this period of time marriages were arranged and had little to do with love. A successful marriage was perceived as one that brought material advantages to the participants and their families. As love was clearly unrelated to marriage the requirement for romance could be gained outside marriage - as long as the rules relating to chastity and fidelity were strictly adhered to. The above rules of Courtly love demonstrate how playing this game could lead to all kinds of problems within the court circle. The ideals of Medieval Courtly Love was publicised in the poems, ballads, writings and literary works of various authors of the Middle Ages. Geoffrey Chaucer, the most famous author of the Middle Ages, wrote stories about Medieval Courtly Love in his book Canterbury Tales. The Miller's Tale describes the art of Medieval Courtly Love. Geoffrey Chaucer exhibited Medieval Courtly Love for the beautiful Blanche, the wife of John of Gaunt. Whereas his marriage to Phillippa de Roet was seen as a good but practical match. The wandering minstrels and troubadours of the Middle Ages sang ballads about Medieval Courtly Love and were expected to memorize the words of long poems describing the valour and the code of chivalry followed by the Medieval knights. The Dark Age myths of Arthurian Legends featuring King Arthur, Camelot and the Knights of the Round Table further strengthen the idea of a Knights Code of Chivalry and Medieval Courtly Love. The Medieval Times website provides interesting facts, history and information about these great people and important historical events which scatter the Medieval History books including Medieval Courtly Love. The Medieval Times Sitemap provides full details of all of the information and facts about the fascinating subject of the lives of the people who lived during the historical period of the Middle Ages. The content of this article on Medieval life and times provides free educational details, facts and information for reference and research for schools, colleges and homework for history courses and history coursework.